After 13 miners were trapped in a coal mine in Sago, West Virginia, four years ago, rescuers didn't know where to look for survivors — they could have been anywhere between 11,000 and 13,000 feet from the entrance. Radio waves can't penetrate very far through rock, so there was no way to communicate with the miners. A new system developed by Lockheed Martin aims to change that, by using magnetic waves to carry voice and text messages. The MagneLink Magnetic Communication System works like a radio, but at extremely low frequencies. Unlike radio waves, magnetic energy can penetrate coal and rock, says Dave LeVan, the research engineer at Lockheed who developed the system. It can connect to the short-wave radios miners use to communicate within mine shafts, but it has a much longer range and can reach the surface. 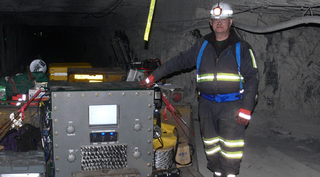 Each MagneLink system consists of two units, one on the surface and one inside the mine. The in-mine unit is encased in an explosion-proof box and uses very little power, so if it were to short out, there wouldn't be enough energy to produce a spark that could ignite methane inside the mine. It would be placed near the mine's refuge chambers, which are now required in underground mines and are designed to shelter miners in case of an explosion. The Sago disaster was the impetus for the work, along with some inspiration from a former Lockheed engineer whose uncle worked in West Virginia coal mines, LeVan says. He learned that mine telephones may only be placed near elevators, and that in any case, the wires would melt in a fire or an explosion. He wanted to develop a wireless system instead. Initially, he considered sonar, familiar to Lockheed's engineers who work on submarine communications. But LeVan found that sonar takes a lot of power, and any mine device needs to be low-powered enough to prevent a spark. "Sparks were just not going to work," he said. "In my research, I ran across many discussions about how magnetic fields are easily able to penetrate rock and coal, so I thought of a wireless system that uses magnetic fields to go through the rocks." The MagneLink system modulates text and voice much like a radio would. Each unit includes a keyboard for text messages and a device to capture voice, but the audio input takes longer to reach the surface. Its battery lasts 24 hours and it would most likely be turned on only in an emergency, LeVan says. Lockheed tested the system last month and found it works inside the mine to a distance of 2,800 feet. It can penetrate about 1,550 feet from the surface. Warren Gross, Lockheed's project manager for MagneLink, says he expects the system to be certified by the federal government in the next couple of months. Lockheed has worked with the National Institute of Occupational Safety and Health to develop the system, he said. In other mining news, mine safety inspectors said Monday that methane sensors at Massey Energy Co.'s Upper Big Branch mine had not been tampered with. An explosion at the mine this spring killed 29 miners and injured two. Although the MagneLink system would not have helped those men, it represents a new step in mine safety, which has been in the government's spotlight since the Sago disaster. Gross said several mining firms are interested in the technology, and some have allowed Lockheed engineers to interrupt their work to test the system. "The coal companies are after this communication device as well," he said. Popular Science is your wormhole to the future. Reporting on what's new and what's next in science and technology, we deliver the future now.